Five innovative and diverse research projects were awarded $45,000 in Seed Grants last week by the Gary and Mary West Foundation, in collaboration with the CSU Institute for Palliative Care. 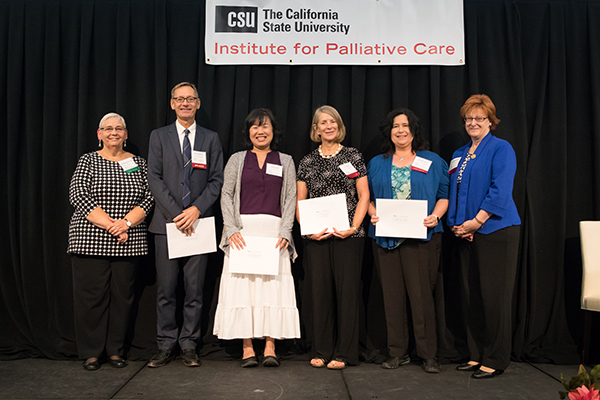 The winning proposals – aimed at expanding the availability and efficacy of palliative care, in ways that enhance quality of life for seniors and caregivers – were announced Friday, Sept. 29, at the Institute’s National Symposium for Palliative Education and Research, at Cal State San Marcos. Four proposals were awarded $10,000 grants, and one received a $5,000 grant. They ranged from a project to increase palliative care in the Latino community to one designed to create a more meaningful end-of-life experience for ICU patients at a major metropolitan hospital. The recipients were announced at the symposium by Brenda Schmitthenner, Program Officer with the Gary and Mary West Foundation, whose mission is to enable seniors to successfully age in place and protect their dignity, quality of life and independence. “We couldn’t be happier that these seed grants will foster exploration, innovation and research at our nation’s colleges and universities,” she said. Adam Shapiro, PhD, Director of University Relations & Research at the Institute, said the mix of grant recipients underscores the power in approaching palliative care from multiple fields of study, in ways that deeply benefit vulnerable patient populations. The grant recipients were selected after a nationwide call for research proposals from faculty working in medicine, nursing, social work, communication and speech disorders and other disciplines. Their projects demonstrate new ways to improve and advance the field of palliative care, to address patients’ physical, psychosocial, emotional and spiritual needs and optimize quality of life by preventing and managing suffering. Brian Carpenter, PhD, of Washington University – $10,000. Dr. Carpenter’s project, “Enhancing Palliative Care Knowledge through a National Lifelong Learning Network,” is focused on creating a palliative care educational program for adults that includes a discussion and framework for advance care planning. Thanh Huynh Neville, MD, MSHS, of UCLA – $10,000. Dr. Neville’s project, “Creating a Meaningful End of Life Experience for Older Patients,” centers on implementing a “3 Wishes” intervention for older patients likely to die in the ICU. In the study, the care team will help patients articulate three wishes, then the team will try to implement them. The study will later evaluate how the intervention affected family and clinician satisfaction. Wendell Hanna, PhD, of San Francisco State University – $5,000. Dr. Hanna’s project, “Somatic Movement and Music Protocol for Seniors in Hospice Care,” aims to ease pain for bedridden, wheelchair, and ambulatory seniors in hospice. Somatic movements are non-strenuous and designed to increase flexibility and range of motion in joints. The CSU Institute for Palliative Care is dedicated to increasing access to and awareness of palliative care by educating current and future professionals as well as community members. It offers palliative care-focused professional development and continuing-education courses that are enhancing the skills of current and future healthcare professionals across the country and around the world. Housed within one of the largest university systems in the United States, the Institute leverages the strength of the CSU to deliver evidence-based online and in-person palliative care education to healthcare professionals working in health systems, hospices, skilled nursing facilities, health plans, case management, and physician practices.